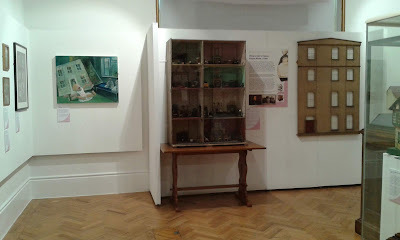 Re-imagining the Doll’s House at Maidstone Museum, Kent, UK. 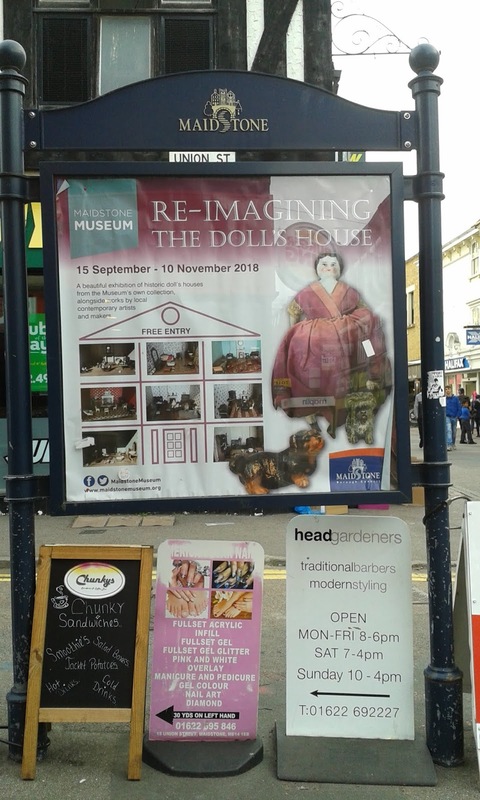 Victorian houses on show include an estate made, six-room mansion of 1869, owned by the Whatman papermaking family of Vinters Park in Maidstone. 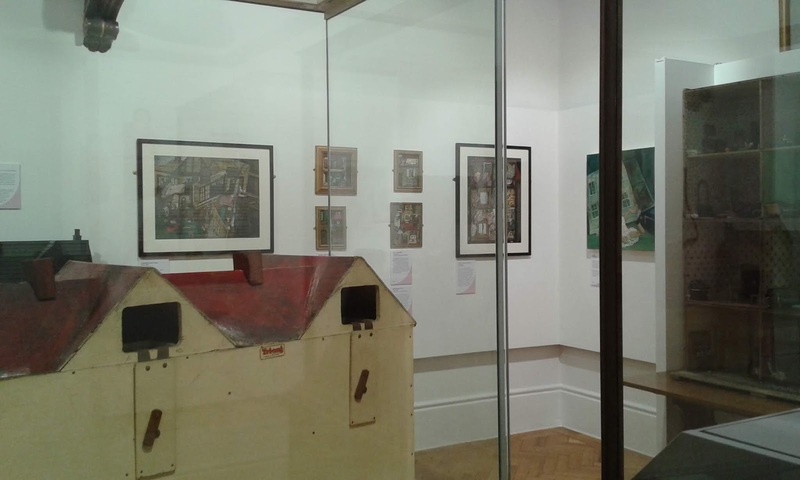 Retaining original papers and full of typical Walterhausen furniture, European and British made household equipment and dolls, it fascinates both collectors and today’s children. A Silber & Fleming box back of around 1880, lavishly decorated in the fashionable ‘Aesthetic’ style, contrasts with a simple home-made mock Tudor house from the 1939-45 War. Other vintage gems include a wonderfully accurate teenager’s bed sitting room made by a local WI group in 1963 (sited in the Museum’s ground floor to advertise the exhibition) which makes an interesting contrast with the mass produced, plastic 1990 Barbie Rock ‘n’ Roll Radio House! Artist’s works inspired by doll’s houses include illustrator Jenny Kallin’s quirky takes on life in a vintage doll’s house, a 12th scale hobbyist house presented in an illusion of surreal decay and a hamlet of tiny houses made entirely of detritus washed up on the beach. 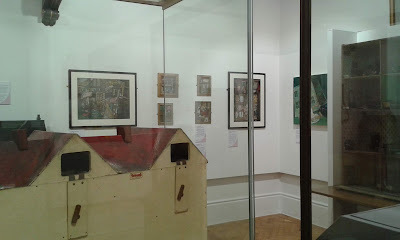 Other works explore more personal issues, making the whole exhibition simultaneously thought provoking and delightful. 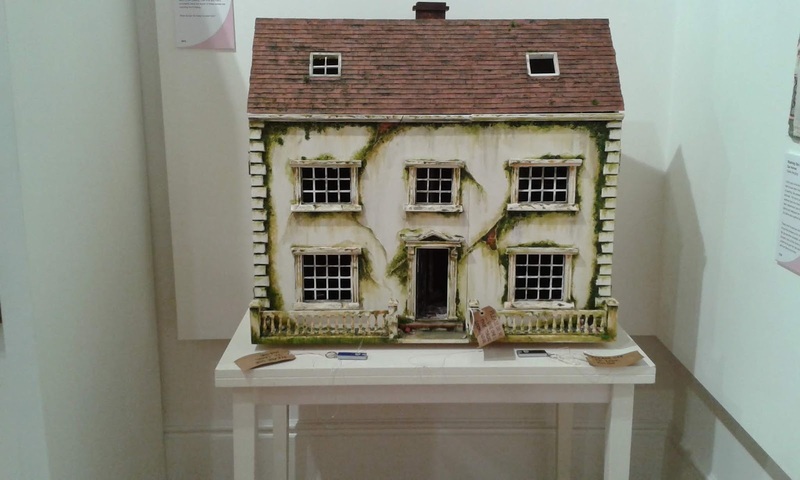 This is a ‘must see’ exhibition for doll’s house enthusiasts, and is already attracting a wide range of new visitors to the Museum who have made special journeys. 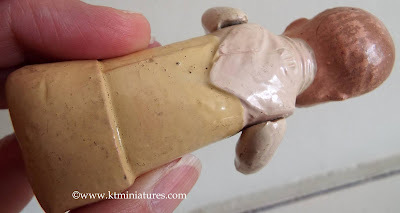 Rare & Unusual Miniature Swaddled Doll! 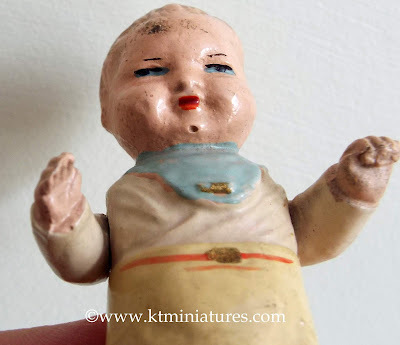 This extremely unusual and rare miniature doll is believed to be of either Japanese or German origin, and has just gone up for sale on the "Old Dolls House Doll Page" of KT Miniatures website. 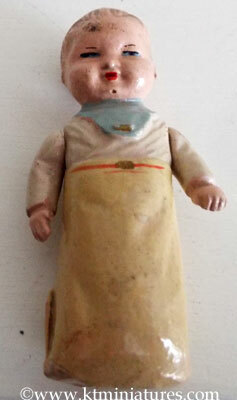 I have tried to research this unusual doll, but cannot find anything remotely like it at all. 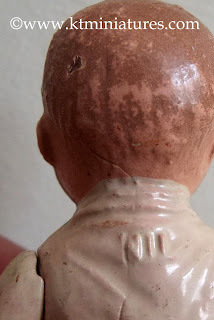 As I do not profess to be a miniature doll expert, I can only go on what the previous owner has told me, what I can see in front of me, and what I have or haven't handled or seen in my 22 years of trading. And I can honestly say that I have NEVER seen anything like this before, so I think I can confidently agree with the previous owner and say that it really is quite rare! This is absolutely gorgeous. At first I thought it may be German, but the longer I look at it, I can't help but wonder if it is possibly Japanese? 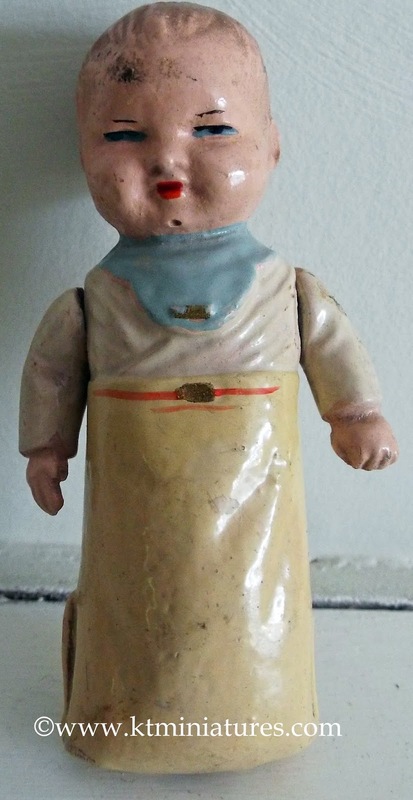 The previous owner thinks that this is a composition doll. The head and body are fixed, the two arms are movable and as you can see, it has been created to give the illusion that it is swaddled in a blanket....it is just exquisite! 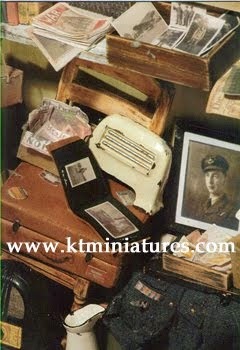 The painted features are simply wonderful and the overall patina gives this a truly antique feel to it. I don't think the photos do justice to the beauty of this little treasure. 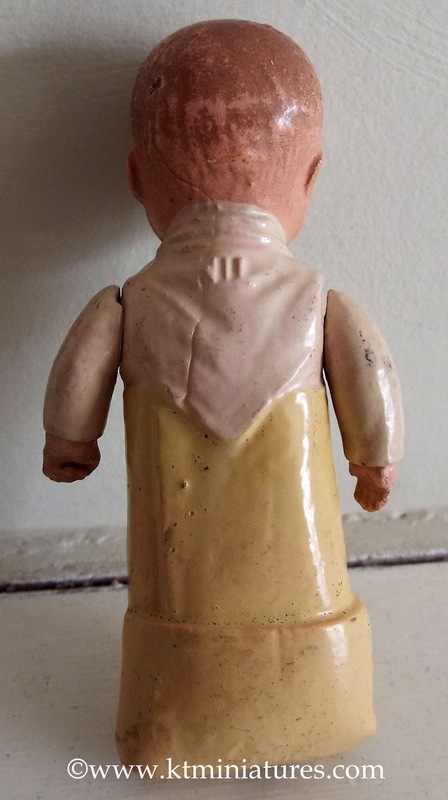 On the back there is some sort of maker's mark but I just cannot identify it? It seems to read something like NIL...or NII? If anyone can shed some light on the maker then I would love to hear from you. It measures 3 1/8" long and is in a good played with condition, so I suppose in dolls house scale terms, it is a little large. There are only one or two weeny minor nibbles. Right at the base there is a manufacturer's hole. Please get in touch asap if you wish to purchase this. 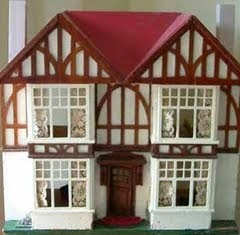 Assorted Vintage Dolls House Items In Aid Of Further Fundraising.. 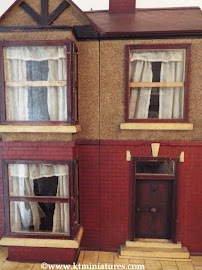 I have been given the following dolls house items by a kind lady from Berkshire and another kind lady from Oxfordshire, to sell in aid of the "Help Save Dolls Houses Past & Present Website Fund". As a reminder of why there is fundraising taking for a new DHP&P website, if you click on the following link, you can read all about it. 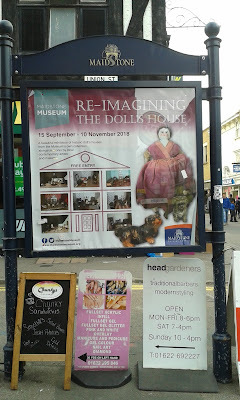 You will no doubt have seen on a previous blog post that the three antique dolls that were put up for sale on here to raise funds for the DHP&P new website fund, have either been sold or are reserved. So a huge thank you to the very generous buyers! 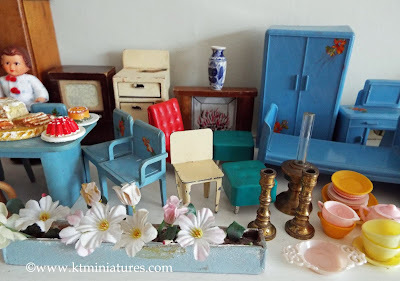 Now to these lovely items...the two sets of donated vintage dolls house items have been put together to make just one whole collection. Sorry but I just do not have the time or resources to list them individually, so I would just say that they are being sold as seen. 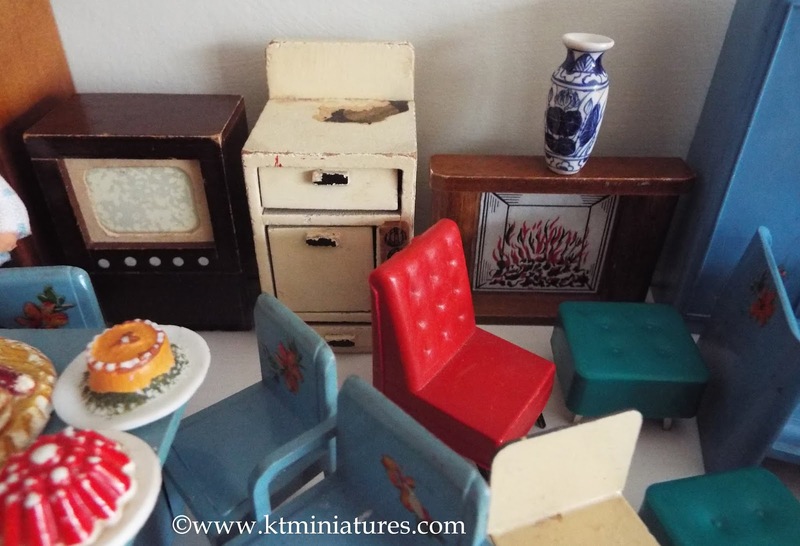 As you can see, they really are a mixed bunch in various scales and eras, but most are probably instantly recognisable to vintage dolls house collectors. 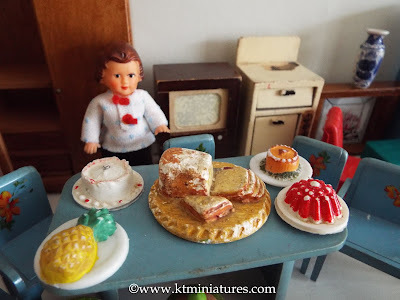 Amongst the general old plastic and wooden furniture, items that are worth a special note, is some of the food such as the Kaybot plaster bread on breadboard and two Tri-ang plastic plates of food. Other items of special note is the rather delightful Dol-Toi fireplace and console television, two Tri-ang stools and a Tri-ang living room chair, a tiny yellow painted metal chair, plus a couple of tiny 1960s dolls. There is hard blue plastic table and five chairs, all with a pretty floral decal, a vintage flower box filled with fabric & plastic flowers, two brass candlesticks, parts of a not so old lovely over sized wooden plate and coffee pot set (maybe Japanese), a useful not so old Korean wardrobe with two internal drawers, shelves and hanging rail, plus an attractive not so old blue and white vase. 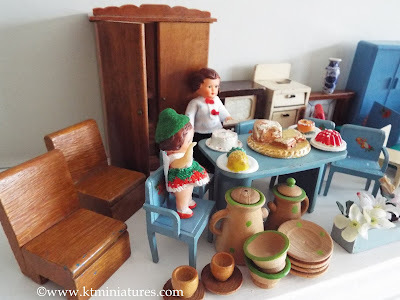 There are two vintage wooden chairs, several oversized homemade books with leather/fabric covers, a brass lamp, a not so old metal fan fire guard, odds and ends of plastic plates & cups, plus some vintage small scale hard plastic furniture (maybe from the 1980s/90s?). Could be useful to someone. 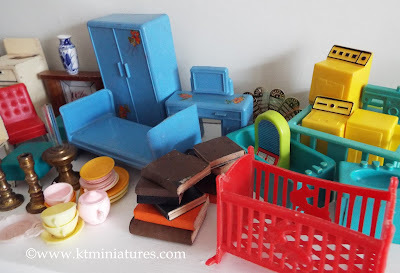 Most of the items seen above are in a relatively good played with condition with some wear, however it must be said that the old blue plastic wardrobe and dressing table are a little warped (common with this particular plastic set), the paper detail is mostly rubbed off the wooden cooker hob, and one of the red rockers on the red plastic cradle have split but hardly noticeable, although could be glued if so wished. To be honest, this whole set is worth considerably more than the asking price so a bargain for someone and you will be helping a worthy cause too. If anyone would like to purchase the above set, then please do get in touch with me asap: info@ktminiatures.com This set of items will be sold on a first come, first serve basis. Hope someone out there can give these a good home. Please Note: This is a one off sale and I am not able to accept any further donations. 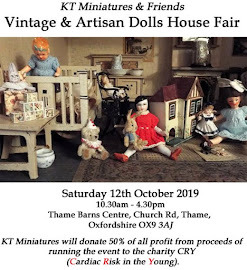 However, if you do have any other items to donate, please get in touch with Rebecca Green, her email is: greenreb41@hotmail.com , the owner of Dolls Houses Past & Present website. I understand one of the administrators is selling donated items off Ebay on behalf of the new website fund and in some cases, also off their website.